Ever since we got our dog, Daisy, she has been a fast eater. I've seen dogs eat quick before, but this is crazy. I swear she doesn't even chew her food. It's gone in about 10 seconds. We got her from the pound when she was 2, so maybe she didn't get much food before. Who knows what her life was like. Maybe she had to fight for food, so the quicker she ate it, the more she would get. Or maybe, she's just a fast eater. She would eat (inhale) so fast that after every meal she would start gagging. Probably because she has whole pieces of dog food stuck in her throat. She never actually threw up from this, but we figured it was only a matter of time. To fix this, at first, we would stand by her while she ate, and every 5 seconds pull her away and tell her to sit. We would be able to do this maybe 2 or 3 times during each meal, and it seemed to help. Who really wants to have to do that every time their dog eats though. Every time I would go to a pet store I was on the lookout for a certain feeding dish that would help with this problem. The only ones I usually saw had a big bump in the bottom, which was suppose to slow them down. This didn't look to promising for our dog though, so I kept looking. One day, while buying a new crate because Daisy learned how to get out of the old one, I was at Petco and saw a new item. It is called Drop Slo-Bowls. I saw 4 different designs/colors, but they all did the same thing. You can see in my picture that the bowl is broken up into a maze. 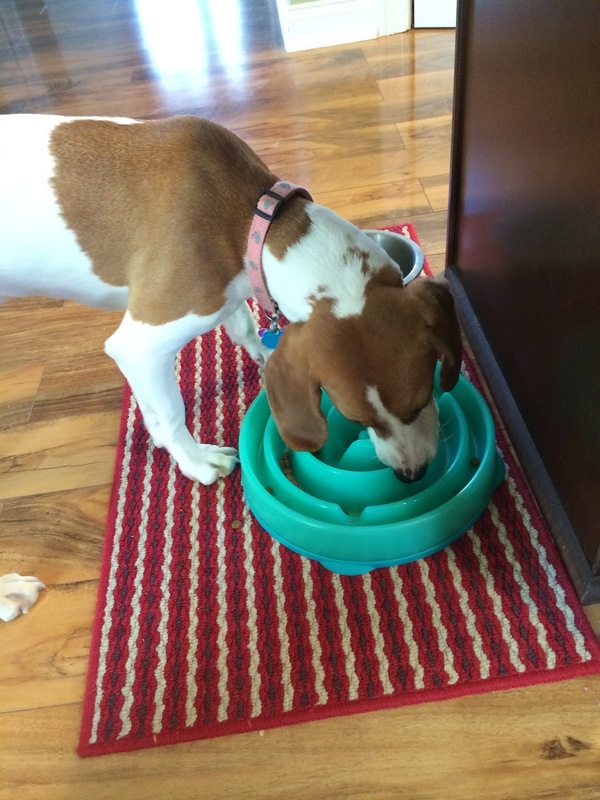 It is made so that the dog can't easily stick her nose into it and slurp up the food. She actually has to move around to get it all. This bowl fixed our needs completely. It takes her between 5-10 minutes to eat now. She does not seem frustrated at all by it, which is good, and she is still able to get to the food. It just slows her down, exactly what we were needing. So, if you are having the same problem we were, I'm sure this would be a great fit for your family dog as well!